At least 25 MPs must be present for a sitting to be valid. Members of Parliament on the Solomon Islands have been roundly criticised for failing to show up for work after not enough MPs were available to hold a debate this week. According to Radio New Zealand International, Monday's session of parliament was abandoned as no quorum was reached to make discussions valid. Particularly aggrieved was opposition leader Jeremiah Manele, who pointed out that two government ministers who were due to answer questions in the house failed to appear. In a statement published by the Solomon Islands Broadcasting Corporation, Mr Manele called the apparent lack of commitment shown by government MPs "shocking and disgraceful", saying that the ruling coalition has "an absolute majority of more than 35 MPs so achieving quorum should never be an issue". "MPs were elected by the people to represent them in parliament, and this should be their paramount responsibility," he said. 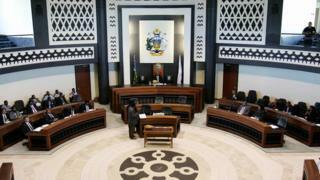 The constitution of the Solomon Islands dictates that at at least 25 of the country's 50 MPs need to be present for a sitting to be quorate. The ruling coalition, of which the United Democratic Party has the most members, controls 41 of the seats. This proportion is far higher than other countries. In the UK parliament, the quorum is set at 40 members out of 650 seats, though they don't all have to be present in the House at the same time, and debate can theoretically continue with just a single MP and the Speaker.